An Italian cookery course that specialises in piquant & healthy Abruzzo cooking… a region that many Italians consider one of the Top 3 regional cuisines of Italy. Yet Abruzzo cuisine, and indeed the region itself, remain unknown to many outside of Italy, despite Abruzzo being host to Italy’s oldest & most famous cooking school, Villa Santa Maria, and the region’s renown for fish, meat & cheese dishes, a range reflecting the splendidly dramatic mountain and coastal landscapes of this Italian region. 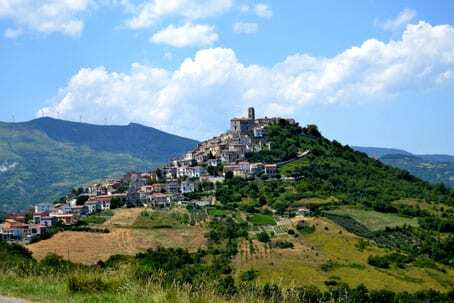 The Abruzzo Cooking school, Abruzzo Cibus, is based in the small but stunning medieval hilltop-town of Carunchio, 714 masl, in the Chieti region. Housed in the beautifully restored C18th Palazzo Tour d’Eau that sits amongst Chieti’s mountains, inland from coastal Vasto (so famous across Italy for its unique Brodetto Vastese, fish soup), Abruzzo Cibus has 6 double rooms all with en suite bathrooms, TV etc. ; an airy modern purpose-built demonstration kitchen plus a vaulted ceiling restaurant mean that groups here will never be too large and that an Abruzzo cooking class can be tailored to suit individuals as well as being professionally geared to cater for groups. What I loved about my one-day Abruzzo cookery course was that it helped support a family run business who were passionate wine & foodies and who believed that Abruzzo cookery skills weren’t just learnt in the kitchen but by going out & about to meet the local community who provided the region’s integral products. This part of the cooking tour can’t be over emphasised in importance in a community-led cooking style that was formerly characterised by barter, exploring, tasting, looking at the hands that trim cuts of meat ready for succulent un-fatty salami. Seeing & learning about the colour and make-up of soil for example all helps to understand an ingredient and how it can be used and of course indirectly gives a great ‘tick’ for sustainable tourism, in which all local families benefit from those holidaying to Abruzzo. We joined the Piergiovanni family from the US (check out their blog from their tour, great read), who had combined their week of Abruzzo cookery classes with a heritage & genealogy tour, exploring the father’s Abruzzo roots. They wanted to find out more about the Abruzzo birthplace of his grandfather who grew up in the small mountain town of Civitella messer Raimondo before moving to America and becoming a butcher. His grandson wanted to show his own family the places from where his grandfather and many other Abruzzesi émigrés had originated, before forming new lives in Philadelphia. Genealogy combined with learning to cook seemed a fantastic way to explore your Italian and, most importantly, Abruzzo heritage. There would be the genealogy tour of the Abruzzo villages and towns where ancestors grew up, finding birth certificates, seeing old family houses, the church where so many ancestors were baptised and married, meeting second and third cousins and seeing your grandfather in people that you’d never met in your life and sharing food together. Combine this with learning to cook like Nonna and having the skills to bring her back to life in your own kitchen via smell and taste is something wonderful. We thought it the perfect holiday for what would have been the Nonno’s great great grandson who was just off to University – not only was he learning dishes to look after himself but he’d have a whole week’s worth of delicious ways to cajole and impress all those girls on campus; the next day the family were learning how to be sommeliers, another pulling string perhaps! The day commenced with coffee, juices and a fantastic selection of cakes in the restaurant before we all piled into the minibus and set off for a scenic journey to explore F.lli Bruno Ventricina factory. Being based in the Teramo province we are primarily used to ventricina being a soft paste like you spread over bruschetta; in the Vasto area it’s a rich spicy rough salami that takes between 3-4 months to mature for which you have to carefully hand-trim the pieces of lean pork and mix with wild fennel seeds and chopped sweet & hot chilli. It was a shame there wasn’t a tasting for it but there is a small shop in which you can buy the product, but still interesting to view the whole process. It was then off to one of Abruzzo’s Slow Food Olive Oil winners at the La Selvotta. Here you got to taste properly a whole selection of oils… Now I knew all about glugging your olive oil to get its taste, if you want to do it properly it’s none of the dipping in bread stuff, but similarly to red wine, the correct way is to have a small beaker, cover and warm with your hands, then smell, taste (that does mean swilling it around to let your whole palate get the flavours) and swallow – that part was new! Purists will hate the next sentence but their lemon infused olive oil is the best I’ve had and worth a trip to go buy a bottle, perfect for drizzling over fish. 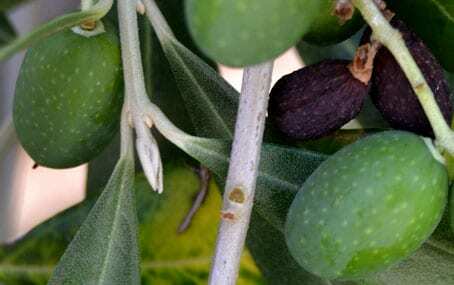 In the mill we were shown a jar of the choice chipped olive stones that are used by companies that sell olive oil light – horrific and to be avoided at all costs if you want anything nutritional from your oil! Back to the Palazzo to enjoy a multi-course lunch prepared by the Palazzo’s Chef Dino. One of the family was a vegetarian so the Chef had prepared a selection of dishes that weren’t just delicious but everyone in the group would feel comfortable eating. They began with a gorgeous creamy truffle pie as a starter something I hadn’t had before in Abruzzo and apparently a signature dish of the Chef, followed by a risotto stuffed with wild mushrooms that I particularly liked as it wasn’t overly creamy. 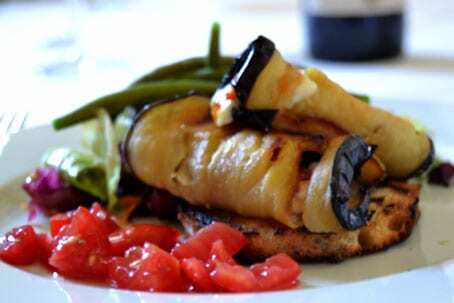 My favourite was the main of stuffed smoked slices of aubergine with a particularly great tomato salad and a divine chocolate tart to finish… thank goodness there was a small siesta before we started our afternoon cooking classes! There is nothing better in a hot Abruzzo sun than a cooling limoncello and our first lesson was in learning how to make this, accompanied by wine of choice or cooling beers (for the adults anyway)! It’s always good to get to the basics even though it wouldn’t be ready for 2 weeks! This was followed on by a demonstration for Sformato di Ricotta con le Pesche – beautiful marinated peaches in apricot nectar on a bed of minted ricotta. Followed by Stuffed Peppers the Abruzzo way and mozzarella hamburgers, a nifty little starter for how to show off the very best mozzarella! The classes were taken by chef Cheryl Molino, an American Cook who decamped to her husband’s native Abruzzo. She had some nice little anecdotes to throw in whilst we watched and then chopped & stirred and was great at involving the 3 teenage kids, getting them thoroughly engaged and not afraid to give and show them how to use a knife… something that some of the adults too needed a little bit of coaxing with! I’d recommend a session even if you don’t do a 4+day course, it’s good to learn 4 courses that were so good that we’ve already practiced again with them at home.